Dr. Licht is a Professor of Paediatrics at the University of Toronto and Staff Physician in the Division of Nephrology, The Hospital for Sick Children (SickKids). Dr. Licht is a Senior Associate Scientist in the Cell Biology Program of the SickKids Research Institute. Dr. Licht is also cross-appointed as Associate Member of the Institute of Medical Science (IMS) and Laboratory Medicine and Pathobiology (LMP) of the University of Toronto. Dr. Licht is the chair of HUS International (HUSi), and chair of the International aHUS Registry. Dr. Licht also serves on the editorial board of Kidney International, Nephrology Dialysis and Transplantation and Pediatric Nephrology, and has published numerous peer-reviewed articles and book chapters related to his research focus.Dr. Licht’s research focuses on complement-mediated renal diseases such as atypical hemolytic-uremic syndrome (aHUS) and membranoproliferative glomerulonephritis (MPGN) / C3 glomerulopathy (C3G). 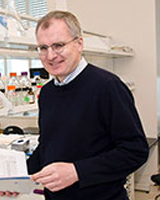 Dr. Licht’s research has translational character and includes both clinical and basic research: he has established an international registry with biorepository (www.kidcom.ca). Also, he has developed a basic research program focusing on the pathogenesis of complement-mediated thrombotic microangiopathy (TMA). In particular, Dr. Licht is investigating the consequences of complement activation on endothelial cells, platelets and neutrophils, and the interaction of these cells in TMA pathogenesis. The results of his research can change our understanding of the pathophysiology of aHUS and may ultimately allow for the development of new treatment strategies not only for aHUS but also other complement-mediated diseases.